You might remember that I mentioned being lucky enough to head along to the launch of The Loop.ie several weeks back, you might also remember that a couple of weeks later I high-tailed it to London for a weekend of shenanigans with my Sis – what connects the two I hear you ask, getting to try out the super simple and potentially dangerous (to your bank balance) Loop.ie with a trial €50 voucher is the answer. 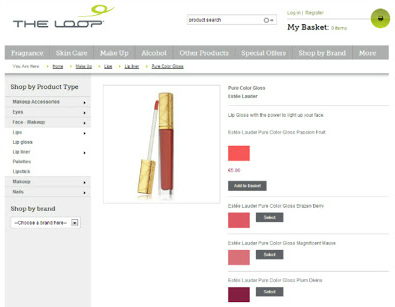 TheLoop.ie is a virtual home for all of the airport shopping delights that you can fawn over and consider without any pesky loud speaker shouting that ‘You, Ms CherrySue, will be turfed off this flight if you don’t unhand the MAC and get your tuckus on the plane!’*. With all of your favourite brands for beauty, accessories and alcohol (within the EU), whether you’re flying from Dublin, Cork or Shannon you can now order anything from the site and have it waiting for you on your check in day. 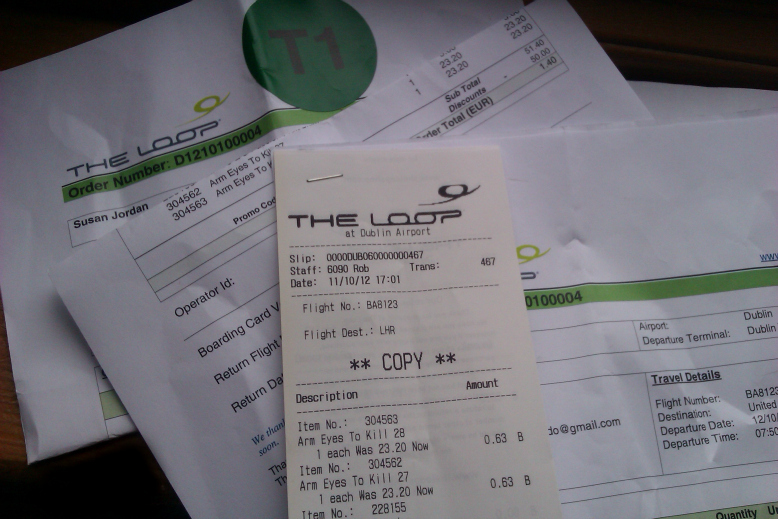 Having waited with bated breath until the prerequisite 48 hours before my flight, I logged onto TheLoop.ie with my flight number, time and destination My details were automatically pulled up and I was off, studiously salivating over every other page – envisioning topping up the voucher, blowing all of my holiday spends on bargain beauty and dining on bread sticks for the weekend. Knowing my grá for Armani’s Eyes To Kill (one of my HG shadows), I decided it’d be nice to treat The Sis. I picked up colour 28 for her and colour 27 managed to slip into my virtual basket for me (more on that soon). At €23 each I was feeling no pain. Now my limit of €50 for trial purposes was pretty much depleted but I thought it rude not to continue perusing. That’s when I stumbled upon this gorgeous bargain on the Estée Lauder page. My choice of gloss for €5?! So thrilled was I that it’s already been a Monday’s Moment. This little purchase pushed me €1.40 over the voucher value. Thinking the site would have a meltdown if I tried to top up, as other sites can, I was pleasantly surprised when it readily accepted my Laser card for the few sheckles extra and sent me a confirmation mail with full instructions immediately. Pick up for goods ordered on the site starts at 4am in each terminal so there’s plenty of time to collect them, even if you’re on the reddest of red eyes. The confirmation email contains clear, step by step directions to get you to your collection point – in my case it was in Terminal One so towards the back of the Terminal (where Bobbi Brown and Duty Free are located). Upon presentation of my email and the Laser card used to make the whopping €1.40 payment, my goods were retrieved from the locked storage behind the desk and handed over. Really couldn't have been simpler. Should you not want to bring your purchases with you (If you've gone a little mental with the buying), you can always avail of the Shop & Collect scheme and have the airport hold onto your goodies until you land back in Dublin post holliers. Choosing this option means that once your flight touches Irish soil again you get a reminder text to pick up your goods (If you haven’t spent the last two days of your break with your palms sweating in anticipation of getting ‘em). And that’s it, it really is that straightforward and simple. Order, Collect, Love: Bish, Bash, Bosh. Have you tried the service yet? 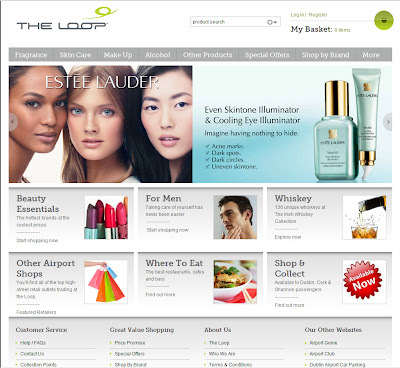 the only Irish online retailer of MAC Make Up! this is music to my travel loving lugs! So handy! Tempted to try this when I head off next month, but there's something exciting about browsing the Duty Free before your flight, hmm..
love that you can pick up goodies on arrival,especially if you are flying with crappy ryanair & worried about weight. I use shop & collect all the time!